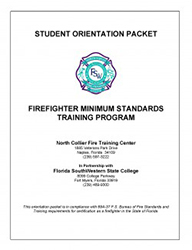 The North Collier Fire Training Facility is located at the North Collier Fire Control and Rescue District’s Station 45 in Naples, and is certified by the Florida State Fire Marshal as an official firefighter training center. Equipped with a fire tower and burn room, the facility is essential in training firefighters for real-life response situations. The facility was recognized as the 2015 and 2018 Fire Training Center of the Year by the State of Florida. 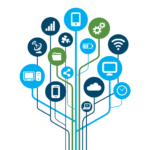 The collaboration of instructors and training the center provides, its success rate, and the mentorship students receive both during and following completion of their training programs are but a few of the reasons the center was chosen. The facility is also a designated regional training facility for the State of Florida. 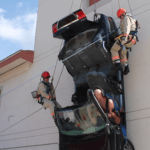 Florida SouthWestern State College facilitates firefighter certification programs through the North Collier Fire Training Center, under the direction of Academy Coordinator Mike Jimenez and Assistant Chief Eloy Ricardo. 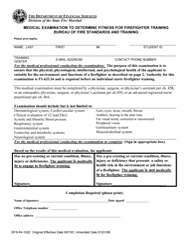 The 480-hour program prepares students for certification as fire fighters in accordance with Florida Statute 633. 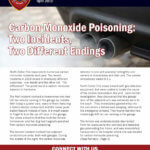 The program is approved by the Division of State Fire Marshal, Bureau of Fire Standards and Training. Content for the program includes, but is not limited to, orientation to the fire service, fire alarms and communication, apparatus and equipment, fire behavior, portable extinguishers, fire streams, fundamentals of extinguishment, ladders, hoses, tools and equipment, forcible entry, salvage, overhaul, ventilation, rescue, protective breathing equipment, first responder, water supplies, principles of in-service inspections, safety, controlled burning, employability skills and first responder. For questions about the Fire Training Facility/Academy, contact Academy Coordinator Mike Jimenez via email.